Researchers at NASA, Los Alamos National Laboratory and the Department of Energy announced they have successfully tested a small nuclear reactor that may someday provide power to human habitats on Mars and beyond. Called Kilopower, or KRUSTY (Kilopower Reactor Using Stirling Technology), the reactor comes in several versions to meet power needs from 1 kilowatt (enough to power a small kitchen appliance) to 10 kilowatts, and four or five would be needed to provide power for a habitat on Mars. “Kilopower’s compact size and robustness allows us to deliver multiple units on a single lander to the surface that provides tens of kilowatts of power,” said Steve Jurczyk, associate administrator of NASA’s Space Technology Mission Directorate, during a press conference on Thursday. Kilopower could support manned missions to Mars in several ways. “We would need power on Mars for two primary reasons,” said Patrick McClure, Project Lead for Reactor Development at Los Alamos, in the video above. “The first is that astronauts need power for their habitat, so that they can make oxygen, purify water, but prior to their arrival, we need to make liquid oxygen and propellant so that they can get off the Martian surface.” Kilopower provides a fairly straightforward solution, requiring a minimal number of parts and thus lightweight, for the power needs of any planet-bound mission. The system works by incorporating steam-pipe technology, in which a sealed tube in a heat pipe circulates fluid throughout the reactor while generating heat. The heated fluid then travels to a Stirling engine, where it pressurizes gas to power a piston connected to a motor that generates electricity. Combining these parts makes for a reliable, simple device for providing power for all kinds of space missions. As for next steps, the research team intends to conduct a full-power test of their device in March. If all goes well, the sky may well be the limit for this compact powerhouse. A Kilopower nuclear reactor at NASA could someday be used to power human habitats on Mars and beyond. 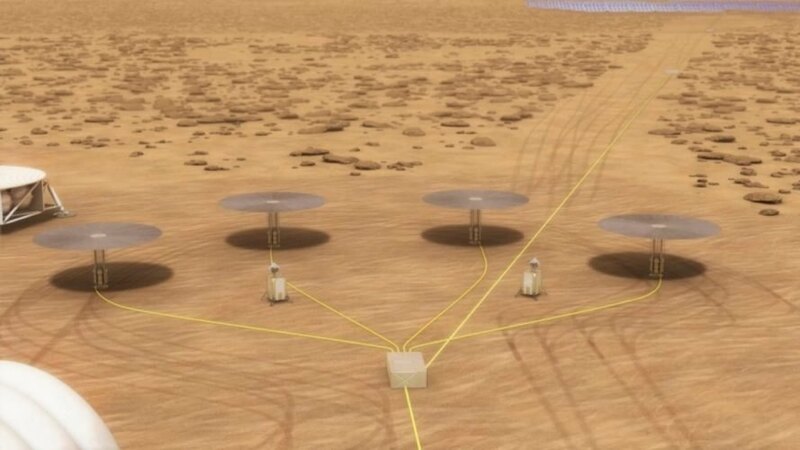 An artist's depiction of several Kilopower reactors working together to power a human habitat on Mars.